Over 7 million people in Canada speak French. This should come as no surprise since Canada has deep historical ties to France as well as the United Kingdom. From its snowy mountains to its envied southern shores, France is naturally one of the most popular countries for Canadians for vacation, employment, and emigration. If you are a Canadian business or individual, or have documents that were issued in Canada, you may need to use some documents for your affairs in France. These include but are certainly not limited to birth certificates, police checks, marriage certificates, powers of attorney, and affidavits. Unfortunately, these documents cannot simply be presented there in the format they were issued. Canadian documents that need to be used in France will have to undergo a process of validation to prove they are authentic. For French documents that need be used in Canada or elsewhere in the world, this is known as an apostille. Although you may be told to get an apostille in Canada, this is not possible. Even though the apostille process is used in over 100 countries worldwide, Canada has not signed the Hague apostille convention and instead uses the original process of authentication and legalization. This two step process is equivalent to an apostille and will be recognized as such within France. 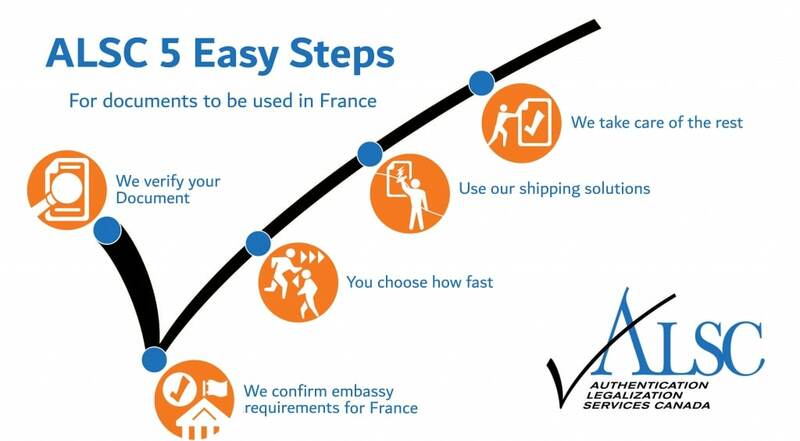 To make your documents valid for use in France, they will have to be verified by two bodies: first by Global Affairs Canada (the authentication stage) and then the consulate at the embassy of France (the legalization stage). Global Affairs Canada is located here in Ottawa, and there are French consulates in Toronto, Vancouver, Montreal, Quebec City, and Moncton. If you have Canadian documents for use in any French territories such as Guadeloupe, Martinique, Saint-Martin, Saint-Barthélemy, Saint Pierre and Miquelon, Reunion island, Mayotte, French Polynesia, New Caledonia, and Wallis and Futuna, they will require legalization at a French consulate. It seems like a straightforward process, but there’s a catch. Global Affairs Canada takes up to 20 business days to authenticate documents they receive. Additionally, the French consulates have their own series of requirements, fees, and processing times which change frequently. Furthermore, the French consulate at which your documents will need to be legalized will depend entirely on where they were issued. As you can see, this simple process can get very stressful, time consuming, and costly to figure out. This is in addition to any complications that may arise during shipping. In fact, it is very unlikely that it can be done properly on the first attempt. For many Canadians rushing to meet their deadlines in France, this is simply unacceptable. This is why thousands of Canadian businesses and individuals choose the convenient and affordable alterative: ALSC. When we opened our doors 25 years ago we became the first service provider in our industry. For over two decades since then, we have helped tens of thousands of Canadian pharmaceutical companies, law firms, construction companies, actors, and even famous musicians with their foreign affairs. The processes we have developed have become the industry standards, and as the original pioneers we continue to be the best provider of the authentication and legalization service. On our priority same business day service we can have your documents authenticated on the same day they arrive at our office, saving up to 20 days off of your processing time. We also offer a standard 3 business day and economy 10 business day service which combine affordability with efficiency; you save time no matter what. Our commitment to service quality and our attention to every detail has gained recognition from both Global Affairs Canada as well as every embassy within Ottawa and dozens more across Canada. The strong relationships we have built with their staff has enabled us to be up to date on their changing policies, requirements, and fees. The result is an unparalleled level of service to our clients, backed by our service guarantee which ensures your Canadian documents will be valid for use in France. When you use our services, you get your own personal agent to help you prepare your documents, answer your questions, address your concerns, and give you detailed updates at every step of the process. We are proud to say that we can assist you in French as well. Upon completion, we can ship your documents anywhere in the world they need to go through one of our many shipping partners. If you have Canadian documents that need to be used in France, contact us. Refer to the rest of the article to find our more about some Canadian documents for use in France, how you can get them, and how we can help you. Canadian birth certificates, marriage certificates, death certificates, divorce certificates, and powers of attorney are a few documents that you may require for your personal affairs in France. These are often requested from you for purposes of citizenship, marriage, inheritance, and matters related to property, respectively. Canadian vital statistics documents such as birth certificates, marriage certificates, and death certificates are issued by the province wherein the life event occurred. As for divorce certificates and divorce judgements, they are issued by the court at which the divorce was finalized. Powers of attorney on the other hand can be drafted either by yourself or by a lawyer. Regardless, your Canadian power of attorney will need to be notarized by either a lawyer or notary public to be valid for authentication at Global Affairs Canada. The signatures on birth certificates, marriage certificates, and death certificates are recognized by Global Affairs Canada and therefore do not require any additional processes such as notarization prior to authentication. Divorce certificates and judgments also usually contain signatures that are recognized by Global Affairs Canada, but occasionally these signatures are difficult to read or are missing the printed name of the signatory. Make sure to check this prior to sending us your documents and contact the court which issued the divorce certificate or divorce judgement if necessary. Getting your Canadian vital statistics document is easy. Chances are you still have yours lying around birth certificates, marriage certificates, and death certificates are some of the most important documents you can be issued in your lifetime. If you need to order a new one, you can use the links below to do so, at which point you can choose to have it shipped to our office. Many of our clients choose to do this to save time. Another Canadian document that is commonly requested for use in France is a police check. There are hundreds of local police checks which can be issued across Canada. These will first need to be notarized by a lawyer or notary public before they will be valid for authentication at Global Affairs Canada and subsequent legalization at the embassy of France. However, it is important to note that locally issued police checks are not always accepted by requesting parties in foreign countries, even though they have been made valid for use in France. This is because locally issued police checks are usually based only on name and date of birth, which means there is a chance that the police checks are not an accurate representation of a person’s true criminal history. This is why many Canadians choose to get an RCMP police check instead. The RCMP is Canada’s leading law enforcement authority, similar to Interpol. Police checks issued by the RCMP are more thorough, draw from a larger database, and are based on fingerprints as well. Furthermore, RCMP police checks contain signatures that are recognized by Global Affairs Canada, making them valid for authentication upon issuance. It is also convenient that the RCMP headquarters is located here in Ottawa, which means that if you need your RCMP police check and order it from their headquarters in Ottawa, you can save a lot of time by having it shipped directly to our office for processing. In this case, it is possible in many circumstances to have your RCMP police check authenticated and legalized for use in France before it would arrive to you unprocessed by regular mail, especially if you are currently outside of the country. You can get started on getting your RCMP police check by clicking here. There is no question that getting your Canadian documents ready for use in France can be difficult. Because of over two decades of hard work we have developed an expertise unlike any other that allows us to provide a swift, stress-free authentication and legalization for our clients. We know that it can be equally difficult to trust a third party with your personal documents. Our proud membership with the Canadian Chamber of Commerce, our A+ rating with the BBB, and our countless 5-star reviews on both Google and Facebook are proof that you can rest assured knowing your documents are in good hands. Furthermore, if you live in or near Edmonton, Halifax, Vancouver, Victoria, Surrey, Calgary, Regina, Winnipeg, Toronto, North York, Mississauga, or Montreal you can save yourself a trip to the post office as well as the shipping costs and use one of our service centers instead. When you use our service centers, your documents receive free priority shipping via FedEx to our head office in Ottawa for processing. However, make sure to call our head office before using our service centers. If you fail to do so we may not be able to accept your documents for processing. Upon completion, you can choose to pick them up from any one of our service centers across Canada free of charge. Alternatively, we can ship your completed documents anywhere in the world they need to go at an additional cost. When you have our team on your side, you have nothing to worry about. Click below to get started with the experts in Canadian documents for use in France!